Pictures of a Terrible Floor Refinishing Project... Buyer Beware! In my fifteen years of flooring, I've had my share of projects, where I was called to go and fix some terrible floor refinishing or installation projects, of some guy that offered to complete the project for prices that, the homeowner should've known are too good to be true. There are plenty of floor contractors out there working hard to be the cheapest in town. But, almost always, when it's time to execute the project, being the cheapest, doesn't allow them to be the best or, most of the time, even mediocre in their performance. In the end, the homeowner is left holding the bag, while the so called contractor is long gone, focused on destroying another floor. 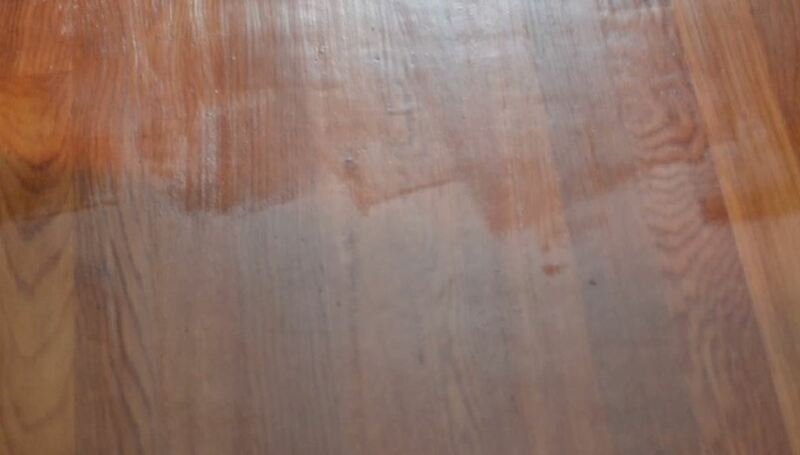 So, take a look at the floor refinishing pictures below and learn. This could happen to you as well, if you're in the market for a floor refinishing contractor. 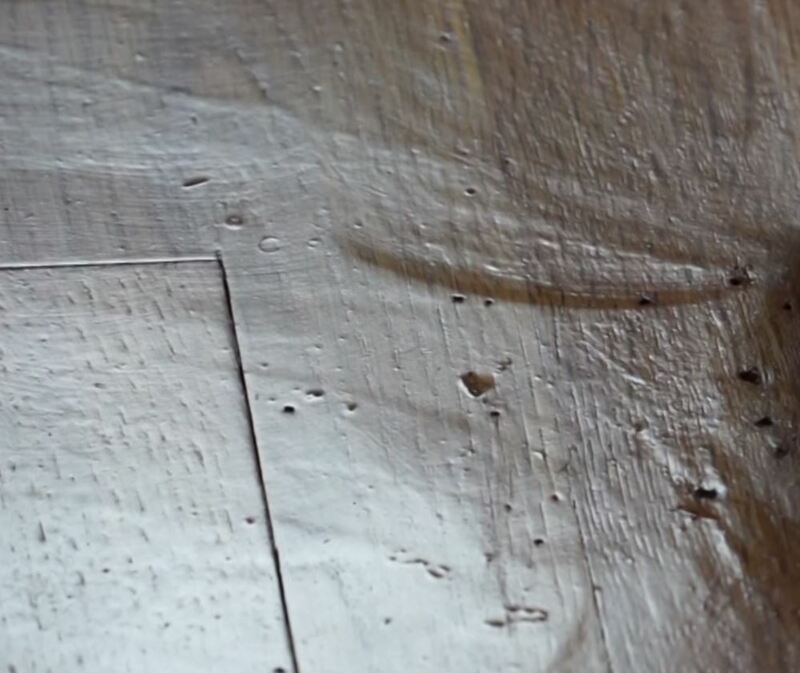 Drum Streak Marks, Bad Sander, Inexperienced Contracor or Both? 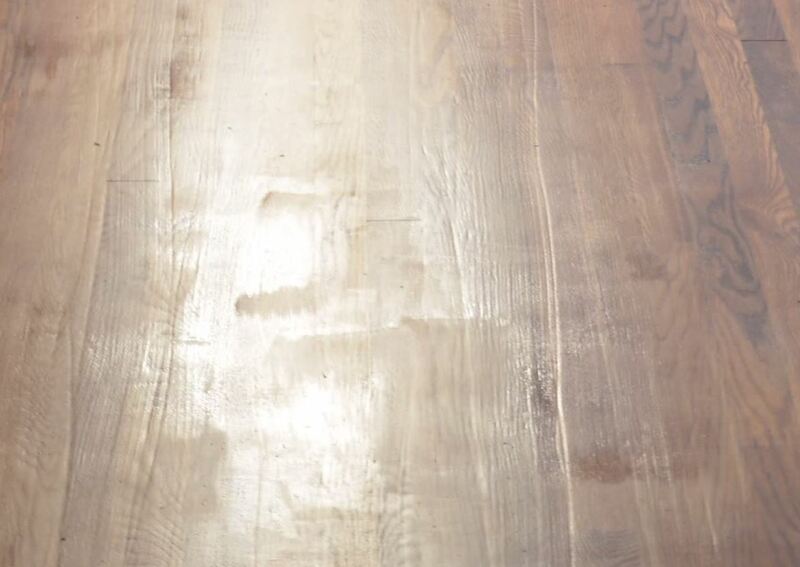 Usually caused by rushing, skipping paper grits, lack of experience or a completely out of ballance belt sander, this is one of the main reasons floor refinishing projects fail. 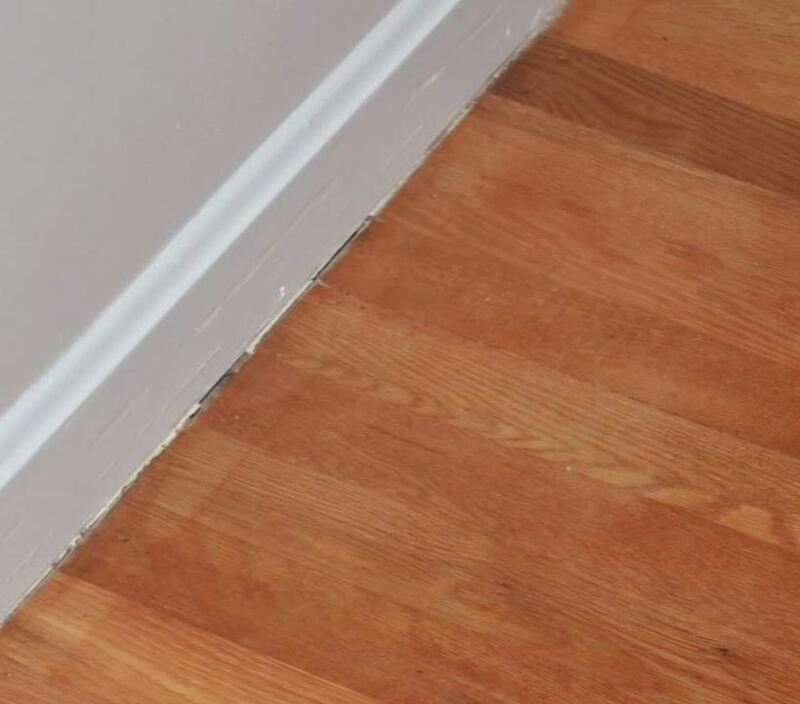 And, very important, a problem like this can be fixed only by executing a complete, start from 0, re-sanding of the freshly sanded wood floor. Wanna make sure this doesn't happen to you? Ask the magic question: how long will it take? Most "good deals" come with a rushed job and are, very likely to end like the job in the picture above. If you feel like you have doubts, give me a call, even if you're out of state. I'd be more than glad to help you and, most of the time, I can guestimate the length of a project without even seeing it, just by asking you a few questions. If, without seeing it, I estimate the project to take four days, and you're being told one day, that's your clue you should keep calling and ask for another opinion. 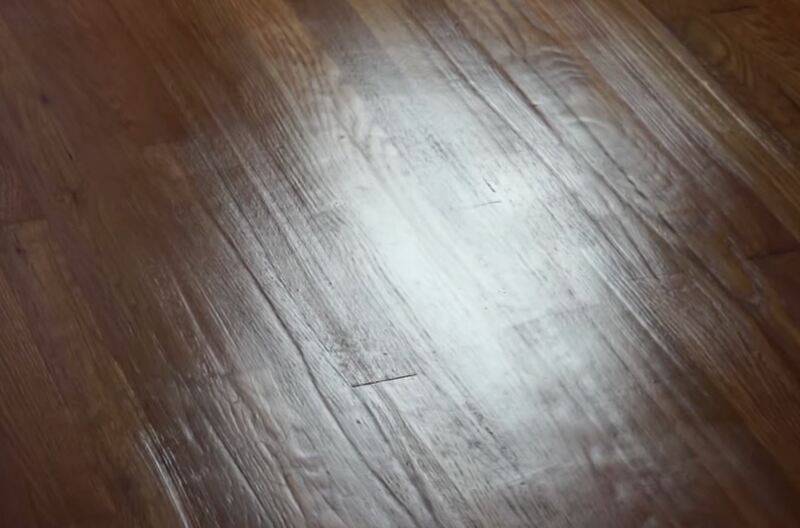 Was This Wood Floor Even Vacuumed, Prior to Applying the Finish? Another reason floor sanding projects fail is improper cleaning. The picture above is pretty suggestive in this regard. The good news is, sometimes, this problem can be fixed without re-sanding the project. 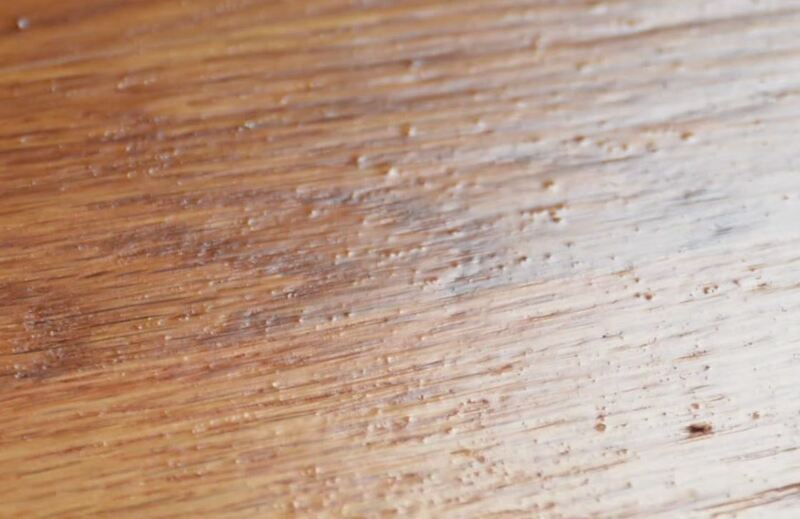 If, however, your other contractor had trapped debris under the first coat of finish and applied the second coat right on top, without buffing and, in some cases, lightly buffed after the second coat and apply a third coat, you might be in trouble. One important aspect to realise, when looking at a picture like this one. He couldn't care less about this home. In either one of these cases, this type of contractors, behave a certain way, they give out clues about their inexperience or lack of character during the interview. In the end, as much as I hate to admit it, this homeowner is partially at fault for the job turning out the way it did. When starting in the flooring business, very often beginers are being asked to learn floor refinishing, while sanding the edges. This is a very tiring task to complete, especially if you're not used to it. 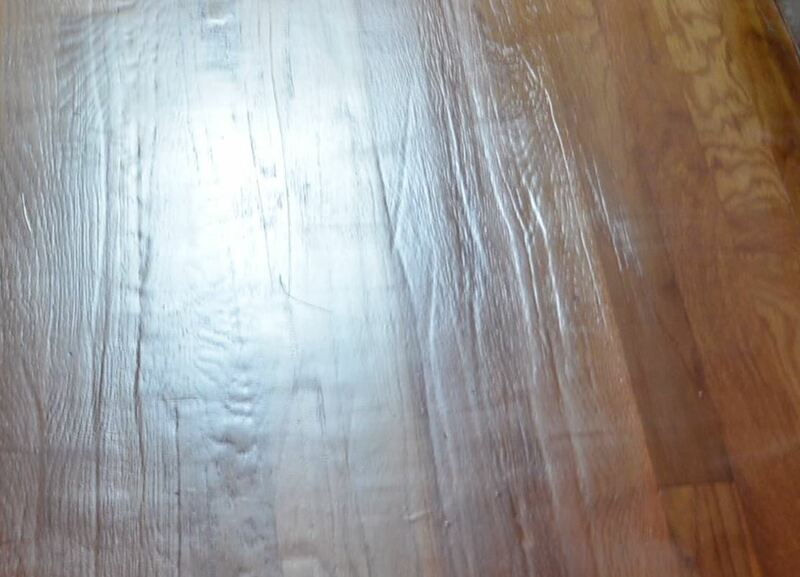 What you see in the picture above is definitely the job of a beginner in the floor refinishing business. Unevenly Applied Floor Finish. Can it Get Any Worse...? Finishing is that part of the project that very few people can do right. It is, while keeping the proportions, almost a form of art and, in most respected companies, is handed over to a few, very experienced employees, to complete properly. Do you see the two inch wide, lighter line in front of this wall? It travels all around this home and is another witness of the fact that these guys should've never been given this project. In the end, the moral of the story is simple: research, research, research. Do your homework, ask the right questions and you will never have to add this type of pictures to your home remodeling album. More questions, as I said before, call me even if you're not from around here. I enjoy helping people like you and I do so, all the time. I worked with both Daniel and Octavian on the refinishing of a 85 year old maple floor. During the remodel of my kitchen we removed multiple layers of flooring and discovered the original maple floor. My contractor suggested that I have the floor refinished. I called Octavian and they were very professional and accommodating to my schedule. They were out to my kitchen and sanded and refinished the floor within the week. I was not home when the work was done. I came home and could not believe my eyes. The floor was beautiful. The floor looked like a new floor, not an 85 year old floor. I recommend them highly for their quality work.